As we get ready to celebrate OUTinPerth’s 15th Birthday we thought it might be fun to take a dive into the archives and look at some older issues of the magazine. Today’s we’ve pulled out Issue 74: November 2007. 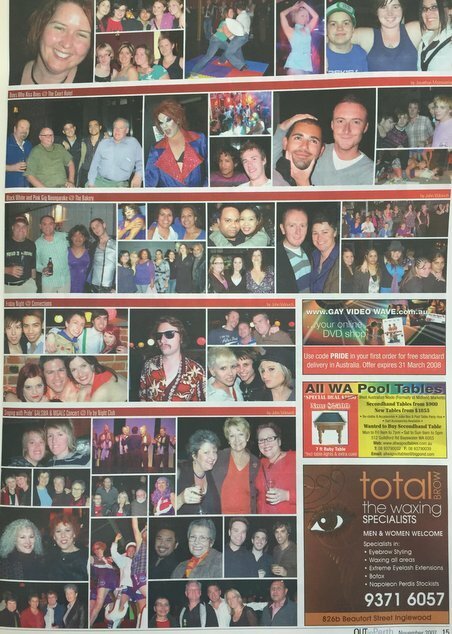 The cover features a selection of photos from Pride night 2007 which has been a held during a rain storm. 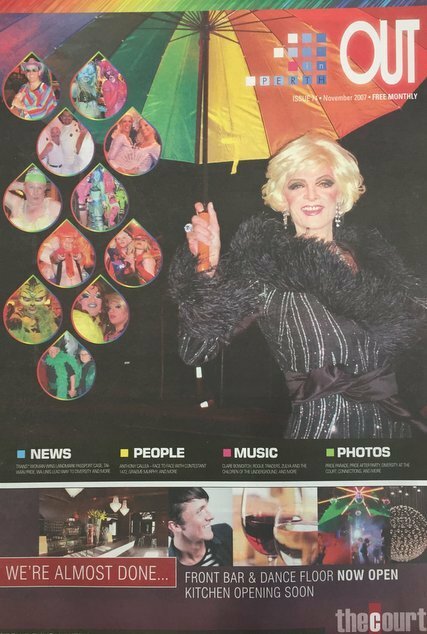 Pictured in the ‘rain droplets’ are many recognisable faces including Bree Maddox, Giz Watson and June Low, drag performers Femiem the Future and Val Nourished and Bears Perth member Michael Middleton. Pride night had featured parties at both The Court and Connections but also an official Pride after-party held at Belmont Racecourse. The Pride parade of 2007 featured 47 floats, an increase from the previous year. In the news, Louise Pratt had just resigned from the WA parliament to in order to campaign for a spot in the federal upper house, and Perth had just elected a brand new Lord Mayor, Lisa Scaffidi replaced Peter Natrass who had held the role for 12 years. In world news, people in Italy were going crazy after a poster showing a baby wearing a wrist band, saying ‘homosexual’, were plastered across the country. The campaign was highlighting that being gay is not a choice. While on a tour of the USA J.K Rowling had announced Proffessor Dumbledore is gay. In the regular column ‘Tea with Miss Catherine’ drag performer Val Uptuous (now known as Val Nourished, sometimes appearing as Val Quaida) chatted to OUTinPerth’s resident drag queen. Val talked about her friend Feminem – who had recently visited from Sydney. Terry Larder chatted to Anthony Callea, who was getting ready to appear in appear in a production of Rent, while Megan Smith interviewed Claire Bowditch, David Campbell and The Rogue Traders. There’s also a chat with local band Zulya of the Underground. In the CD reviews there were new album from Delta Goodrem, Annie Lennox, Muscles and The Pippettes. While in the television section we were talking about Lost, Californication, Shameless and Weeds. The photos included social events at Loton Park, Prime Timers, Pride Professionals, The Bakery, GALSWA, Connections and The Court. There were advertisements for an upcoming tour from Tripod, Alphabet City at the Artrage Festival, and the 1st Asia Pacific Out Games. Want to flick the the pages of some classic issues of OUTinPerth? Come down to our 15th Birthday celebration at Connections Nightclub on Saturday, it’s on at 8pm.